Save time and resources — leave the tedious tasks to us. What tasks can a Hyperion Support Services team help me with? Is having Support Services and a Hyperion Admin redundant? How much can I save with Support Services? What's the difference between a good Support Services team and a bad one? Is Support Services still needed for Oracle EPM Cloud solutions? How can I convince my team to get on board with Support Services? How can I get started with Support Services? Why is Support Services needed? Oracle EPM systems require a level of support that's often underestimated. And, most importantly, getting to go home from the office by 5 p.m.
Expectations often do not line up with reality. Yes, things will be far better than the days of manual methods and inconsistent data — but there are still tedious, time-consuming tasks. While Oracle does provide some support via service requests, it's not enough to manage your entire toolset. Oracle EPM administrators are tasked with a slew of responsibilities. (If you don't have a dedicated admin, these responsibilities are spread across your team.) Depending on the applications you have, tasks include managing metadata, maintaining business rules, supporting data loads, and, of course responding to users when things break. When those things break, users experience slowdowns that can affect everyone from the bottom up. So, what does the user, admin, and leader have in common? They have to stay late. So much for leaving by 5 p.m. every day. This is actually pretty simple. It's probably even easier than the lengthy implementation you went through. You need a dedicated support team — someone there day or night, someone that you know. An admin is a great solution — but you can't expect them to be there all the time. They might get sick, they'll probably want to take a vacation, and they do need to sleep. Your admin might also get promoted to a more strategic finance role or move on to a new role at a new company. If you're the admin, you know it's not realistic for you to do everything, and there are some tasks that you would like to offload so you can focus on more strategic or pressing work. You can make your Oracle EPM expectations a reality with a dedicated support services team. Outsourcing support is usually viewed as a solution that is not ideal, but what we mean by support services is different from what a lot of people think. In the next section, we'll look at some of the misconceptions surrounding support services and the reality of what you actually get. Unfortunately, there are several misconceptions about outsourcing that keep organizations from getting the help they need. In this section, we'll debunk those myths to help you better understand Oracle EPM support services. Is having a Hyperion Support Services team and an admin redundant? If you can snag an in-house administrator (they are hard to find and retain! ), having someone right there is always useful. Aren't most Hyperion Support Services teams overseas? Offshore support can cause a lot of frustration, especially since you're typically dealing with a call center and never the same person twice. But when it comes to Oracle EPM Support Services, there are on-shore teams out there that you'll know by name. Offshore call centers don't work as well with your Oracle EPM technology because the solutions can vary from customer to customer. With a dedicated onshore team, you'll have a group of people who intimately know your environment allowing them to properly and quickly respond to your problems. Before you sign a contract with your support services provider, you should be able to meet the team who will be supporting your environment. The most ideal situation will include at least someone overseas, giving you 24-hour "follow the sun" support. But this shouldn't be a call center — just one or two people who be familiar with your environment and can help while you're working late. How much can I save with Hyperion Support Services? If your organization has just invested in implementing a new system, Support Services may seem like another financial burden. However, an Oracle EPM support services team can actually help you save money. A recent survey of support services customers found that many organizations reduce their support cost by at least 10 percent, sometimes even reaching 75 percent. Many can't even begin to assess the savings because not having the proper support can lead to much more costly consequences. You need the specialized system maintenance combined with the support for critical business functions. By reducing costs, mitigating risk, and increasing the value your organization gets from Oracle EPM, support services provides an excellent ROI. Is Hyperion Support Services only needed for emergencies? Of course, you need someone there when there's an emergency, but that's not the only reason to have a support team on deck. Your Hyperion or Oracle EPM Cloud support services team is also there to anticipate issues. A proactive support team will continuously monitor your environment and perform health checks to ensure your apps are running how they should be. These are tasks that are done consistently — weekly, monthly, quarterly. It ensures your system is running smoothly when you need it most, like during month-end close. The optimization and monitoring of your environment is the part of support services that should truly give you peace of mind, while saving you time and money in the long run. Don't Hyperion Support Services teams only help with technical issues? Depending on the support services provider you're evaluating, there might be some truth to these misconceptions. What your organization needs is a provider that will tailor their services to your needs. It can be difficult to know what questions to ask prospective providers, which is why we built a checklist so you can be 100 percent sure you get the support you need. 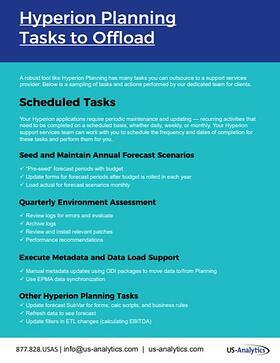 What tasks can I offload with Hyperion Support Services? When you hear about Hyperion support, you usually hear about opening tickets, technical help, and the expertise of the team. But you rarely hear about exactly what tasks are being taken off your plate. A good support services provider will resolve your tickets quickly, but a great support services provider will provide you with a combination of reactive and proactive support. This comes in the form of scheduled and unscheduled tasks. Your Hyperion systems require periodic maintenance and updates to keep your business running smoothly. These scheduled tasks might be weekly, monthly, quarterly, or even daily. These are the tasks that you establish with your Support Services team — ensuring that these tedious to-dos are complete so that you don't have to think about it. Just as important are the unscheduled tasks — those issues that arrive unexpectedly and you need completed in a timely manner. For these unforeseen issues, you'll need an experienced, communicative support services team and a reliable ticketing system. Hyperion Planning and Hyperion Financial Management (HFM) are the most commonly supported Oracle EPM tools. To give you a better idea of the tasks that you can offload, we've compiled a sample of commonly supported items. These tasks (both scheduled and unscheduled) include actionable items executed by the support team. To learn more, check out the detailed list. 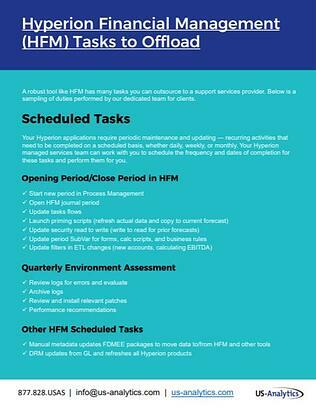 Just like Hyperion Planning, these HFM tasks are just a broad overview of some things our support services team does. To get a more granular view, get the list. Why do Hyperion Admins love Support Services? Every admin has unique issues that cause them to look for help. But what shouldn't be unique is the positive experience you have with a Support Services team. Whether the team swoops in when you're in a tight spot, or you've gradually implemented Support Services after an implementation or upgrade — you should be breathing a sigh of relief. Consider the experience of the Director of IT at Key Energy, a Houston-based oilfield services company. In this role, the Director of IT had a team of two Hyperion admins and was responsible for HFM and Hyperion Planning, as well as Oracle E-Business Suite and Oracle ERP. At the beginning of 2016, the organization began downsizing and the two admins were let go. Left without these integral members, this director had to support HFM and Hyperion Planning. "I had enough knowledge to stumble my way through certain things, but I didn't have the proficiency to get it done quickly and timely to support the business the way it needed to be supported," he said. "It was pretty stressful." After a month of supporting all these systems on his own, Key Energy hired the US-Analytics Support Services team. Because Key Energy lacked more resources to work with the Support Services team, the transition was bumpy for about four months. 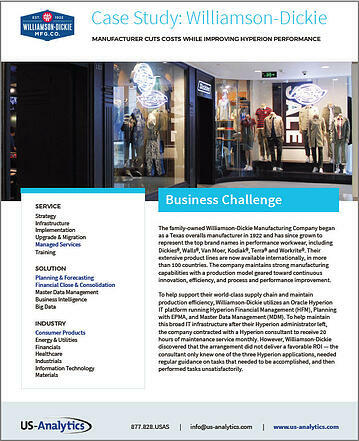 "I was in a no-win situation, and the US-Analytics Support team was still able to accomplish what needed to get done. They really saved my life, so to speak," he said. Beyond swooping in quickly as his support and sidekick, the director said he loves the US-Analytics Support Services team for their communication skills, business process insight, and the onshore, domestic presence. "One of the other things about this arrangement is that even though I have a 'keep the lights' on arrangement, the team has access to a very deep resource pool," the Director of IT said. "If we want to do something differently, and modify our systems, they can do that as well." A key aspect of a great Hyperion Support Services is having a dedicated team — not consultants who have just completed another project and have to learn your entire environment each time you open a ticket. But the dedicated team will also have access to pool of experienced consultants who they can reach out to for additional knowledge and support. Not having to deal with infrastructure is probably a huge reason for your organization moving to the cloud. You no longer have to worry about supporting hardware for mission-critical EPM systems. You have a daily maintenance window where updates occur and defects are fixed. Life just got easier for you, and you’re on cloud nine (pun intended). Before you plan your dream vacation with this newfound freedom, check your to-do list for the maintenance activities that still need to be completed. You’ll see a number of tasks that are tedious, highly specialized, and for the most part, routine — meaning they are perfect for outsourcing to Hyperion experts. Businesses naturally ebb and flow, which is why you’ll need to manage your metadata accordingly to reflect your business and reporting needs. To ensure everything runs smoothly and is consistent with your business needs, you’ll need your hierarchies updated regularly. Whether you’re adding new accounts, creating alternate hierarchies, or updating member formulas, a managed services team will maintain your metadata — allowing your team to focus on strategic reporting. The Oracle EPM Cloud uses Data Management to integrate your data from an ERP system to your EPM target application. You’re also able to drill through from your EPM application and view the data in your ERP source system. Like most things, Data Management isn’t as simple as it sounds. Though you can use it with every EPM Cloud application, there are notable differences between how it works in each application and how it works in the cloud vs. the corresponding on-prem version. There are also many tasks that need to occur within Data Management, like administration and security tasks as well as setting up your source systems. A managed services provider can ensure that everything is set up properly and, if something goes wrong with your data load, fix it quickly and efficiently. Setting up security for your users is still an essential task in the cloud. As we’ve said in past blog posts, there are a lot of things that can go wrong. You’ll need someone to manage your groups and security settings for your users. To understand the complications that occur with security, check out our worst practices blog post. Being in the cloud does take infrastructure tasks off your plate, but you still need a support plan for application support, business processes, automation, and end user support. Outsourcing this work will allow your team to get back to business… and you can pack your bags for that dream vacation. What's the difference between a good Hyperion Support Services team and a bad one? The other reason organizations tend to shy away from outsourcing support services is the nightmare scenarios they've already experienced. We've heard many horror stories — tickets going unresolved due to lack of expertise, long ticket wait times (we're talking weeks), and even not being able to get a member of their support services team on the phone. In this section, we'll look at those nightmare situations vs. how your dream team will respond. There you are at your desk working during month-end close, then something goes wrong. This can't happen — you need things to be back up and running fast. This is your support services team time to shine. You call in your sidekick and they don't respond. It's like Batman without Robin; Sherlock Holmes without Watson; Han Solo without Chewbacca. The bad guys win; the case goes unsolved, the spaceship gets blown up. I'm sure you get it, there's no one there to bail you out of your difficult situation. Don’t dedicate a team solely to support. This is the most likely reason for delayed service. Very few Hyperion consulting firms have dedicated support services staff — so who’s handling the tickets? Consultants in the field are already stretched thin across projects for other customers. Don't have a good ticketing system. If you get multiple responses from support staff that are duplicating efforts, or you have to repeat yourself, your provider doesn’t have a good ticketing system (or they aren’t using it effectively). Don't provide “follow the sun” support. We've talked about this in the former section. Your Oracle EPM solution is a mission-critical system used around the clock by global organizations. If your support services provider doesn’t readily provide 24-hour support, that’s a red flag. Like we mentioned above, fast reactive support is incredibly important. Your dream team should have an easy-to-use, accessible ticketing system so that you have a clear thread of communication and tracked response/resolution times. Like we said before — it's a misconception that support services is only there for when things break. What better way to maximize your time than having your system proactively optimized? At the end of the day, a good support services provider recognizes that their goal is to save you time and energy. If your provider is sending unnecessary back-and-forth emails from multiple points of contact, do they really respect your time? Are they really adding value? Does your support team’s responses (or lack thereof) make you wonder if they are adequately trained in Hyperion infrastructure, applications, and business processes? You’re right to wonder. Hiring fully trained staff or getting junior staff up to speed is not something all providers are willing to do. Support Services providers should be proud of their team. Before a contract is signed, you should see thorough bios outlining specific experience and certifications. You should see references and Net Promoter Scores. And, like we stated above, you should get to speak with the admin team members that you’ll work with on a regular basis. Customers of subpar providers, on the other hand, typically find out the hard way when their systems are supported by an inexperienced team. We’ve talked about the specific skills and experience to look for in a Hyperion support team. Expertise is one of the many advantages of outsourcing Hyperion support — with a good provider, you get access to a much broader and deeper skillset than any one admin could have. Note that while a “follow the sun” model is important for 24-hour support coverage, having an onshore-based team is important for clear communication when you need it most. You can meet with an organization who promises you the moon, but it doesn’t mean they’re going to give you the moon. Some support services providers will make you promises that they don’t deliver on, like deep expertise and quick resolution times. If your support services team promised to optimize your system, but they’re not completing monthly maintenance tasks, then you have a problem. But how can you tell a provider won’t deliver on their promise before entering into a contract? And what can you do about it after the fact? To ensure that a support services provider will deliver on their promises, ask references to compare their experience to what was initially promised. Ask the provider for a full list of Net Promoter Scores — not just a few positive examples they cherry-picked. As mentioned above, a dream team will introduce you to team members so that there are no surprises. Finally, look for value-adds that you don’t see other providers offer. How can I convince my team to get on board with Hyperion Support Services? All of this might sound like a compelling case for Oracle EPM or Hyperion Support Services, but if you're not a decision maker in your organization, it can be difficult to convince management to invest in a change. With the costly implementation just completed, it can be even more difficult to convince management to spend more money. But, as you've learned, getting the proper support for maintaining your applications is incredibly important. After reading this the reasons why you should choose support services are probably obvious to you, but it might be difficult to summarize it for your boss. In this section, we'll look at the talking points you should focus on to get the buy-in for Support Services. If you’re a finance professional, you’re probably all too familiar with the adage “numbers speak louder than words.” In business, this is especially true. The average salary of a Hyperion admin is close to $100,000, according to Glassdoor. Because the skillset to support Hyperion is so rare, organizations must offer admins competitive salaries. If you're investing so much in an admin, you don't want them to burn out and leave. If you have a Support Services team on deck, they can be your admin's sidekick. They'll actually be able to go vacation with peace of mind, knowing that there's a team to handle issues in their absence. As stated above, the support services team can take care of the tedious work while your admin takes care of more important tasks. You want your Hyperion applications to be a solution to increase efficiency, not a system you have to worrying about maintaining that will ultimately weigh you down. If you can show management an estimation of your savings, ROI, and a projection of increased efficiency — the better off you’ll be. Actionable tip: Use our 2018 State of Hyperion Support Services Report for compelling stats, like how much customers have saved with support services. If your organization is new to Hyperion support services or has worked with an inexperienced provider, your boss may have questions like "Can these applications be supported remotely?" or "Will a support services provider share our urgency when there's an issue?" If you anticipate and address these concerns before they come up, management will see that you've thought the business case through. Fortunately, there are many companies out there who have had positive experiences with Hyperion support services. Using their stories will help paint a picture for your boss, showing them how other companies have benefited and saved with support services. How can I learn more about getting started with Hyperion Support Services? A lot of companies are resistant to change, which is why you can benefit from bringing in a Hyperion support expert to advocate for you. An outside expert can bolster your business case with examples from the field and customize a realistic plan for your organization. Request a 15-minute consultation with a Hyperion support services expert to save you time and effort in the long run. Rely on Oracle-certified, US-based consultants who are dedicated to managed services and available 24/7. Scale support based on known and / or unforeseen events. Lower costs while improving application performance and system reliability. Stay ahead of the curve on new Oracle technology requirements and capabilities. Prevent costly and frustrating outages through proactive best practices. Protect data with security exceeding compliance for HIPAA and PCI DSS ( with secure cloud hosting ). Access end-to-end support for your technology investment ( over 100 tasks ). Focus on your business and leave the technology to our trained experts. Detailed service level agreements to ensure clear roles and responsibilities. Rapid problem tracking and resolution, documented by our user-friendly ticketing system. Application and / or infrastructure support. Proactive communication via monthly reports, quarterly reviews, and as-needed phone calls. If needed, secure cloud hosting with multiple layers of protection from the physical data center all the way through to the database.